Pimp Your Post is Back for the 19th installment. To help encourage more engagement when there is extra Voting Power it will be used to reward those who are engaging with the posts featured here. To let @pifc know you have engaged please leave a comment as a reply to the entry comment of other people saying that you visited their post, what you thought of it, and what level of engagement you did (comment, upvote, resteem). This will help us to know who to reward with extra votes. Those who are here just to collect a Bounty, that is fine but you are missing out on the opportunity to build up relationships with other active bloggers. Finding real people who are active and trying to grow their accounts is critical to your long term success. This is the easy part and hopefully one that will bring you some added eyeballs to your posts. Remember nobody is forced to vote on your posts so make sure they are quality. Also don't even think of including stolen content. 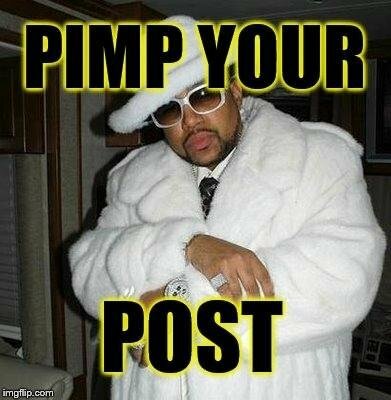 Leave a comment with the Link to Your Post, but also "Pimp It"...that is sell us one why to visit your post. Support Others by Visiting their Posts and leave a reply to their comment that you did so. Naturally we love your support and appreciate your votes and resteems! Know someone that you think would like more exposure to their posts? Then tag them and invite them to Pimp their Post. As an added bonus a @steem-bounty of 2 Steem is being set on this weeks Pimp Your Post. @steem-bounty is a great way for @pifc to be able to reward everyone at a higher level without burning up to much Voting Power or taking a ton of time to send out rewards for entries. This payout happens automatically just after post payout to all entries @pifc upvotes. If you like what @steem-bounty is doing helping engagement on steemit set steem-bounty as a witness. In order to do so you can go to: https://steemit.com/~witnesses and enter the "steem-bounty" account into the text field and click vote. @knircky is the brains behind @steem-bounty and he does a lot to help boost the contest posts allowing for higher rewards. Good SEO tips here for sure. Nice little initiative you have there. Very similar rules to mine, like it. If you ever run into to many people in a week let me know...btw this is @thedarkhorse. Thank you for sharing your story and photos with us! Sounds like your service allows you to gain some knowledge, real experience, all while allowing different parts of your Countries people to work together. Very cool program! You are welcome. I gained a lot of knowledge. It is surely a cool program. Thank you for your comment. As usual @pifc, thanks for your generous initiative. My post for this entry is my last Bitcoin Update, related to the correction that happened. I wrote about the factors that influenced the correction, the areas of support and also about a possible continuation. Pimp My Post Please ! Why Should You Visit My Post ? Because its a unique cool giveaway. As it says there is 2 contests You can make 1 entry that could enter you into two contests! Part of 20 STEEM divided amongst all eligible entries. I have a ton of respect for what @sagescrub is doing with the Homesteaders Co-Op Website. By offering free listings with no commissions charged sellers are able to get their goods into the hands of steemians at the best possible price...and that price is either Steem, SBD or USD which is really cool. That is really kind of you @pifc! Thank you for recognizing the value in our co-op! this post is about my art in color drawing and drawing in black and gray realism here is the link. support these people including me we are art for our viewers and we always teach him something new with our drawings. And remember that we are all trained to draw only a matter of dedication and enthusiasm to learn this art. @pifc has set 2.000 STEEM bounty on this post! @intellihandling has earned 0.167 STEEM. 0.147 STEEM from the creator of the bounty and 0.02 STEEM from the community! @chekohler has earned 0.156 STEEM. 0.147 STEEM from the creator of the bounty and 0.009 STEEM from the community! @brittandjosie has earned 0.153 STEEM. 0.147 STEEM from the creator of the bounty and 0.006 STEEM from the community! @porters has earned 0.147 STEEM. 0.147 STEEM from the creator of the bounty! @aezakmi has earned 0.147 STEEM. 0.147 STEEM from the creator of the bounty! @celinavisaez has earned 0.147 STEEM. 0.147 STEEM from the creator of the bounty! @ajorundon has earned 0.147 STEEM. 0.147 STEEM from the creator of the bounty! @stever82 has earned 0.147 STEEM. 0.147 STEEM from the creator of the bounty! @soulkanzart has earned 0.147 STEEM. 0.147 STEEM from the creator of the bounty! @rentmoney has earned 0.147 STEEM. 0.147 STEEM from the creator of the bounty! @akomoajong has earned 0.147 STEEM. 0.147 STEEM from the creator of the bounty! @cristiancaicedo has earned 0.147 STEEM. 0.147 STEEM from the creator of the bounty!